If you need help getting motivated, turn to fellow runners. Often they have been there and can help you move along. Surround yourself with other runners and you will run. It’s a simple concept. Hello ladies, here is the latest news from the “nest”! I hope everyone got their kids off to school this week without too many hurdles. It has been surprisingly easy around here in the mornings:) Somehow, the return of the kids to school signifies a fresh start for me as well! Maybe it’s my getting back into a routine instead of the late nights, sleep ins and indulging that feels like a new beginning. I don’t think that I am the only one who feels this way. I have had many emails informing me that Chicks are coming back to the group to begin the Sept. 8 programs, and I have had new ladies inquire about starting with us. We should have a good turnout on the 8th! Embrace the schedule! Remember to put your workout times into your calendar, inform your spouse and kids that you will be “busy”. Set the expectation so you won’t be “missed”. You are carving out precious “me” time and at the same time setting a great example for your kids. See you soon! Have you ever thought about doing a Half Marathon? : There are many Chicks who will do a November 1/2 marathon race so give it some thought…. Here is the program you will be using: Half Marathon Training Program 2014 The Thursday night sessions are hill work (Upper Middle) or multiple short sprints. Angus Glen and Hamilton are on November 2nd. Bronte Village Annual Coat Drive: If anyone has gently uses snowsuits/jackets/coats (adult and kids) that you don’t need anymore, you can drop them off September 6th and 13th at Bronte Mall parking lot between 10-2 or anytime at the Bronte Fire Station. Thanks Sam! 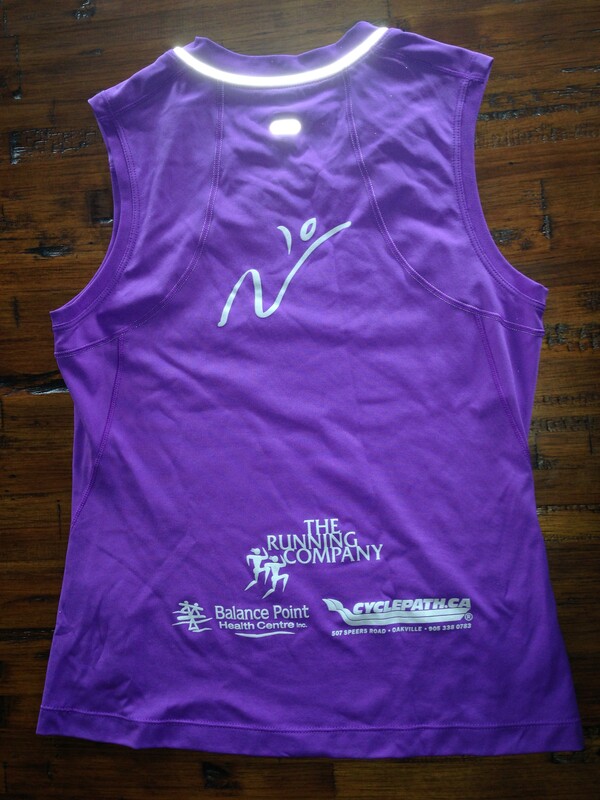 Nik’s Chicks Shirts: Looking for that perfect running shirt? Look no further!! 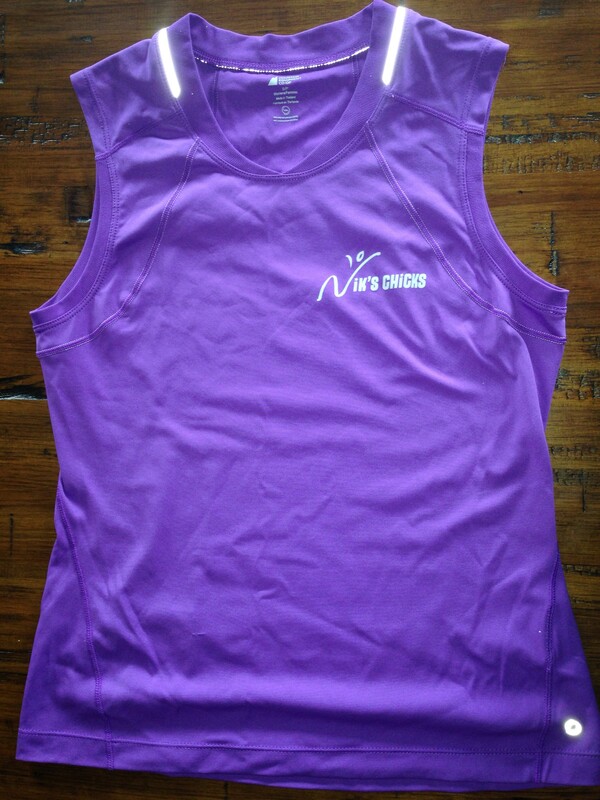 I have Nik’s Chicks purple tank tops (and a few t-shirts) for sale – only 20.00!! They are super light and reflective. Excellent quality tops from Mountain Equipment Co-op! 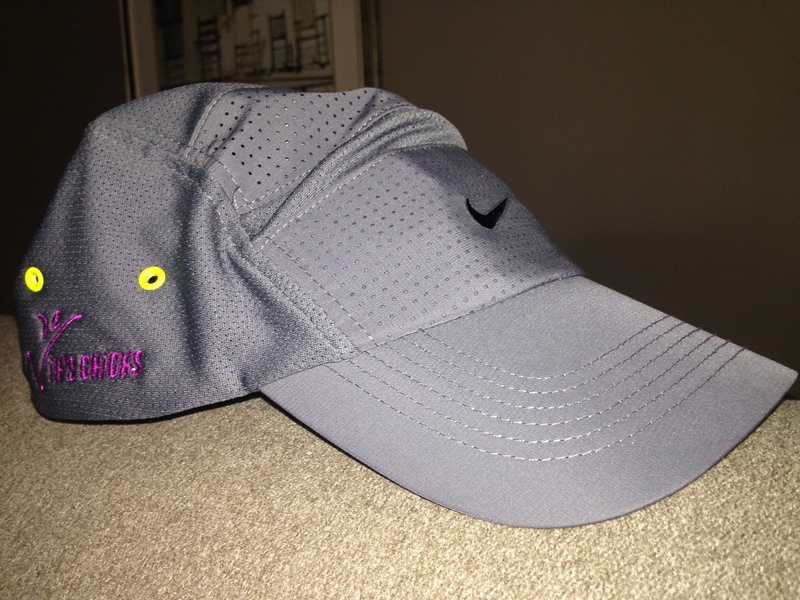 See me after the running sessions to buy one. Cash only please. Quotes from 2014 Runner’s World Daily Calendar: 1) Eat three meals a day (plus 2 snacks) – every day. Our bodies are hard wired to conserve calories when faced with a food shortage. When you skip meals, your body immediately slows your resting metabolic rate. And when you skip meals on a regular basis, your RMR may remain permanently low. 2) It’s a common mistake with a heartbreaking result. The starting gun sounds and you take off – fast. Inevitably, the swift start takes it’s toll and you slow down, missing your goal! Ooops! a more effective way to nail a time is to run a negative split – that is, starting conservatively so that you run the second half of a race faster than the first. 3) Shaving seconds off your runs may be as simple as spending more time in the sack. Sleep guarantees that your muscles will recover. To help nod off, shut off all technology one hour before bed or soak in a hot bath for 15 minutes before turning in. 4) Chill out. After finishing a big race, try soaking in a cold bath for 5-10 minutes and consider wearing compression tights. Both can aid in decreasing inflammation in your legs and speed the rate of healing. 5) Buy shoes that are slightly wider and longer than your bigger foot, for both street and running. also avoid pointed shoes. You will save yourself needless foot pain. Olympic Tri girls -Race Day – good luck! Half Marathon – 13km (Nov 1/2) or 17km (Oct 1/2) depending on the program! Monday – September 8 8:00pm NEW PROGRAMS BEGIN! If you are new to the group, please fill out a waiver Nicole McLaughlin Waiver and Release #2 and fill out emergency contact sheet when you arrive.